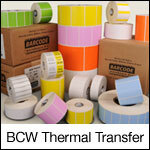 The BCW Thermal Transfer label is a bright white, coated thermal transfer paper facestock that offers high print quality and abrasion resistance for indoor industrial applications up to 8 inches per second. It's general-purpose, permanent, acrylic-based adhesive offers high initial tack and adhesion on a variety of surfaces. Recommended for a wide variety of applications, such as shipping, receiving, and work-in-progress labels. Use with wax or wax/resin ribbon. Compatible with TSC, Zebra and Datamax desktop printers. 1.20" x 0.85" thermal transfer paper label on a 1" x 5" core. 2750 labels per roll / 8 rolls per case. Special features - Perforated. Use with wax or wax/resin ribbon. 1.25" x 1.00" thermal transfer paper label on a 1" x 5" core. 2550 labels per roll / 8 rolls per case. Special features - Perforated. Use with wax or wax/resin ribbon. 1.50" x 1.00" thermal transfer paper label on a 1" x 5" core. 2550 labels per roll / 8 rolls per case. Special features - Perforated. Use with wax or wax/resin ribbon. 2.00" x 1.00" thermal transfer paper label on a 1" x 5" core. 2550 labels per roll / 8 rolls per case. Special features - Perforated. Use with wax or wax/resin ribbon. 2.00" x 2.00" thermal transfer paper label on a 1" x 5" core. 1350 labels per roll / 8 rolls per case. Special features - Perforated. Use with wax or wax/resin ribbon. 2.25" x 0.75" thermal transfer paper label on a 1" x 5" core. 3300 labels per roll / 8 rolls per case. Special features - Perforated. Use with wax or wax/resin ribbon. 2.25" x 1.00" thermal transfer paper label on a 1" x 5" core. 2550 labels per roll / 8 rolls per case. Special features - Perforated. Use with wax or wax/resin ribbon. 2.25" x 1.25" thermal transfer paper label on a 1" x 5" core. 2100 labels per roll / 8 rolls per case. Special features - Perforated. Use with wax or wax/resin ribbon. 2.25" x 2.00" thermal transfer paper label on a 1" x 5" core. 1350 labels per roll / 8 rolls per case. Special features - Perforated. Use with wax or wax/resin ribbon. 2.25" x 2.50" thermal transfer paper label on a 1" x 5" core. 1100 labels per roll / 8 rolls per case. Special features - Perforated. Use with wax or wax/resin ribbon. 2.25" x 3.00" thermal transfer paper label on a 1" x 5" core. 925 labels per roll / 8 rolls per case. Special features - Perforated. Use with wax or wax/resin ribbon.